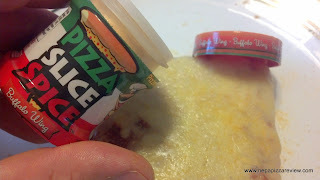 Pizza Slice Spice Review - "Pizza's Best Friend!" 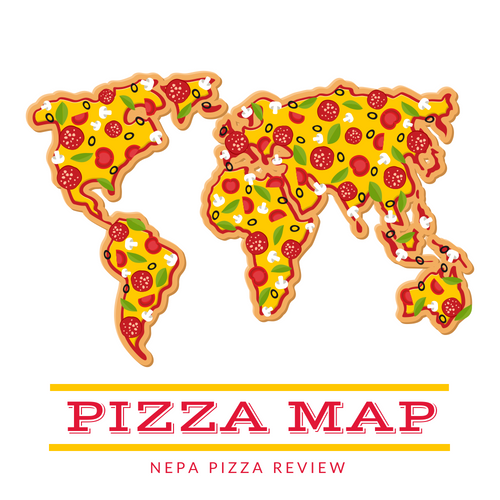 Part of being a pizza reviewer comes with a cool notion that people frequently want my opinion on all things pizza. A short while ago I was contacted by a company with a brand new product - Pizza Slice Spice, which claims to be "Pizza's best friend." They requested that I give the product a try and give my honest opinion. Of course if it's pizza related and I get to give my opinion on it, there's no chance I was going to turn down this opportunity. When the package arrived, inside were four small canisters which resembled the containers that the popcorn seasoning you can buy at the movies comes in. The packaging was bright, vibrant, and attractive to look at, and it was very appealing to me. I checked out the flavors which included Bacon Cheddar, Barbeque, Parmesan Garlic, and Buffalo Wing. This was a wide variety of flavors to choose from, and my excitement began to build. My fellow pizza critic, Marty at Pizza Quixote also reviewed these spices (I didn't read his article before writing this, but will immediately after I publish) and told me that these spices work best with ordinary pizza. 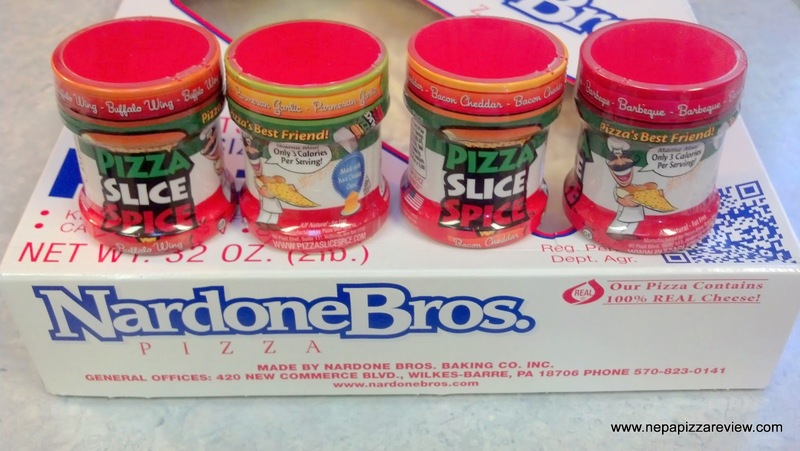 I headed to the supermarket to get the most ordinary tasting pizza I could find - Nardone's Bros. pizza, which is made here locally in Wilkes-Barre. For those of you who aren't familiar, think unfrozen Ellio's with American Cheese on top (also think cheap, soft, fresh, and feeds a family of 4 with ease). I sped home to bake my pizza and get on with the review! Check out the Pizza Slice Spice Website! I randomly chose my spices to use, and first up was Barbeque. I opened the top and sprinkled on a somewhat generous amount onto the top. At first I thought, there's no way that this finely ground spice is going to flavor much at all, but boy was I wrong. A few dashes of seasoning had this slice of pizza tasting like a Middleswarth (Lay's if you aren't from NEPA) Barbeque potato chip. It was quite a sensation eating something with the texture of pizza with the exact flavor of a potato chip. It really stumped me because the flavor really packed a punch of sweet and smoky Barbeque. 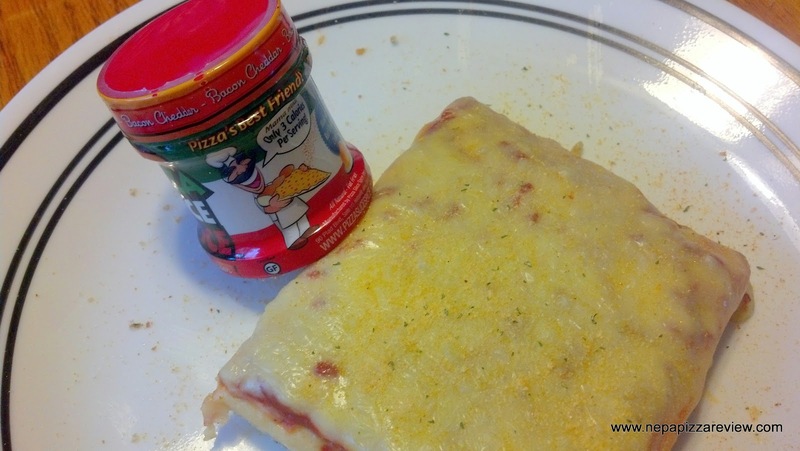 Although the flavor of the spice did take over the whole taste of the pizza, it was certainly not overpowering, and I found it to be well balanced, not salty, and overall quite good! The Parmesan garlic was next up and this spice was even finer than the previous. This one reminded me of garlic powder as it sprinkled on and disappeared into the cheese. The flavor actually tasted a lot like garlic powder, but also packed a pretty pungent flavor of Parmesan. I didn't taste the Parmesan at first, but it's that flavor that stayed with me for minutes afterward. At first, I thought this was a spice combination I could make myself, but after tasting the Parmesan flavor I knew I couldn't put this together on my own! This was the spice that I really wanted to try out the most out of the four as I'm a huge fan of hot wings and chicken wing pizza. With a flick of the wrist, the orange colored fairy dust floated out of the shaker and down onto my Nardone's Bros. pizza and PRESTO, I suddenly had a buffalo chicken pizza! Well, let me back up for a second and actually try it out first! This seasoning was also very nice, the heat level was probably about a 2 out of 10 - easily in the mild category, so don't fear this if you don't like spicy foods. I don't know if it was the magic of the seasoning or what, but I swear I tasted a few hints of bleu cheese in the mix as well. 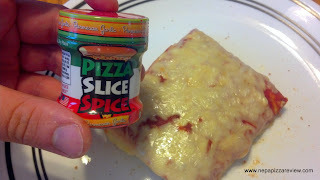 Overall, this spice was a zesty, flavorful treat, and definitely kicked up my neutral tasting pizza a few notches. So this seasoning was really cool...I took a bite and I just smiled because I couldn't believe how much flavor this one had. Again, it wasn't salty, and it really reminded me of eating a bacon cheeseburger hot off the grill. OK, maybe I wouldn't go quite that far, but it definitely resembled the taste and it was a neat experience. Overall, I have to say that I really had fun with these seasonings as they played with my senses, convincing me that I was consuming something other than what I was really eating. I allowed myself to become immersed in the experience of sprinkling and transforming my pizza and I have to say I loved every minute of it. Will these magical canisters replace a well made buffalo chicken pizza, or make you think that you are really eating a bacon cheeseburger? No. But will it make eating ordinary pizza a lot more fun and tasty! This is something that the kids will absolutely love and have a blast with. 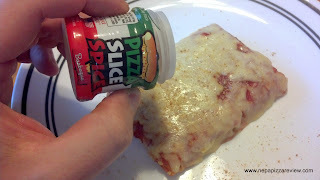 I'm so thrilled that the Pizza Slice Spice guys chose to let me try this brand new product, and I have to recommend that you give it a try and let me know what you think! Perfect test environment there! Good review. Thanks CCPG...I thought it would be a good canvas to paint on!